Mike O’Connor is the author of “A Commercial Republic: America’s Enduring Debate over Democratic Capitalism.” He teaches at Georgia State University and more about him can be found at his website eight hundred words. In his introduction to the 2012 collection of edited essays titled Governing America, Julian Zelizer noted the passing of the “presidential synthesis,” which held sway among political historians until the fairly recent past. This scholarly paradigm is one in which “the power of the presidency is a major theme” and “presidential administrations mark political time.” This understanding, he noted, is a flawed one: political eras do not automatically divide themselves into neat four- and eight-year periods and the “policymaking influence of the chief executive” is “limited” by all sorts of institutional and social factors. Moreover, since the end of the 1960s “historians turned away from the study of government elites and institutions,” focusing instead on subaltern groups who had been neglected in previous histories. He expresses enthusiasm that they are returning to the subject, but warns that new methods are needed. Historians seeking to understand politics must abandon “outdated narratives about political elites” and incorporate into their stories the perspectives of social and cultural history. The other myth that Zelizer challenges concerns Johnson, who is most frequently invoked as a master political tactician with a knack for knowing exactly where to apply pressure to get whatever votes he needed. Viewing his signature achievements from the perspective that Zelizer urges, however, reveals the limits of Johnson’s power. Throughout much of the twentieth century, Senate committee chairs held nearly absolute authority to schedule votes on legislation or to bottle up bills in committee. It was virtually impossible to pass any bill without their active assistance. Under these conditions, neither liberalism nor Johnson comes across as an unstoppable political force. The actual story is a bit more nuanced than one of ascendant liberalism. Zelizer argues that, for a very brief moment “the power of the conservative coalition was diminished.” (8) The civil rights movement generated public pressure that was instrumental in passing the Civil Rights Act of 1964 and the Voting Rights Act of 1965. (The book came out around the same time as the Ava DuVernay’s film Selma, which got caught up in a controversy regarding the accuracy of its portrayal of Johnson’s position on the Voting Rights Act. Though Zelizer did take issue with that specific point, he praised the movie overall and his book’s sensibility is very similar to that of the film.) Soon after the passage of the Civil Rights Act, Johnson won a landslide victory over conservative standard-bearer Barry Goldwater in the 1964 presidential election. The electoral mandate and Congressional majority Johnson subsequently enjoyed allowed him to pass his Great Society programs. But these conditions were not typical of the era and held for only a short period of time. Zelizer fleshes out this argument with a well-written and engaging narrative that highlights the many moving parts involved in this process without becoming overwhelmed by them. Liberal House members founded the Democratic Study Group, which made common cause with like-minded senators such as Eugene McCarthy and Hubert Humphrey. Interest groups such as the AFL-CIO and Americans for Democratic Action served as a counterweight to conservative organizations like the Chamber of Commerce. The NAACP challenged segregation legally through a series of suits that culminated in the Supreme Court’s 1954 Brown v. Board of Education decision declaring an end to “separate but equal” public schooling. Other civil rights protests, such as the Greensboro sit-ins and the 1961 Freedom Rides, increasingly brought pressure to bear on politicians to do something about segregation. Yet the growing power and enthusiasm of this liberal coalition could not overcome the reticence of President John Kennedy, who Zelizer portrays as believing that “the only real possibility for achieving progress on civil rights was by working through the judiciary and executive branches.” (35) Partially to prompt Kennedy for more action, Martin Luther King, Jr. initiated demonstrations in Birmingham, AL, declaring that “the hour has come for the [f]ederal government to take a forthright stand on segregation in the United States.” (45) In response to the growing crisis, Kennedy finally submitted “the boldest civil rights legislation yet proposed by a president in the twentieth century.” (49) The president was struggling with Congress to pass this bill when he was assassinated in 1963. Zelizer characterizes Johnson as “fundamentally more liberal and more committed to the New Deal than Kennedy had been.” (62) Championing his dead predecessor’s agenda out of both conviction and political advantage, Johnson skillfully handled Kennedy’s tax cut bill before turning his attention to civil rights. At issue was not the bill before Congress, which had enough support to pass. Where civil rights advocates needed support was in the vote to end the inevitable filibuster in the Senate. (Senators were wary of challenging the privileges, such as the unlimited debate that allows for a filibuster, that derive from seniority or the chamber’s traditions. They hated the idea that their votes might be used against them in the future should they attempt to take advantage of such perks themselves. Thus supporting a bill while refusing to force a vote on it was not uncommon.) The president distributed pork to various legislators as Humphrey served as floor general in the Senate, battling the southern filibuster. At the same time, civil rights activists organized protests all over the country; by April 1964, 70 percent of Americans supported the bill. (114) These conditions made it possible for Johnson and Humphrey to cut a deal with Senate Minority Leader Everett Dirksen, a Midwestern conservative Republican who supported civil rights. He delivered the votes necessary to end the filibuster and Johnson signed the Civil Rights Act on July 2, 1964. With his eye on the 1964 presidential election, Johnson sought to establish a mandate for his liberal policies and to deliver a Democratic Congress. To that end, he announced the War on Poverty and worked with Congress to pass its central provision, the Equal Opportunity Act, before the election. The Republicans nominated Barry Goldwater, the Arizona Senator who had voted against the Civil Rights Act. The contrast between Johnson’s liberalism and Goldwater’s conservatism could not have been more stark. When the results were in, Johnson had registered the largest percentage of the popular vote in history and both the House and the Senate featured huge Democratic majorities. In alienating so many voters, Goldwater’s extreme conservatism inadvertently paved the way for Johnson’s Great Society. The Democratic advantage in Congress allowed Johnson to be far less dependent on the southern bloc. The president was simultaneously confident that “the possibilities for passing bills seemed almost limitless” (164) and aware that the nature of American politics would virtually guarantee Republican congressional gains in 1966. Thus he pushed hard for liberal legislation. The Elementary and Secondary Education Act increased funding for schools that taught low-income children, while Head Start provided money for preschool for the poor. The makeup of Congress allowed the supporters of health insurance for the elderly and the poor to overcome the resistance of the American Medical Association and establish Medicare and Medicaid in 1965. Even after the Civil Rights Act, African Americans were denied the vote in many southern jurisdictions. Johnson wished to take on education and health care before revisiting racial issues, but civil rights leaders were impatient. They staged protests in Selma, which were met with violent resistance by the authorities there. Some of the protesters were murdered. The televised broadcasts of these events shifted public opinion toward voting rights, and Johnson gave a speech in which he significantly used the movement’s slogan, “we shall overcome.” In August, the president signed the Voting Rights Act of 1965. Meanwhile, Johnson became increasingly entangled in Vietnam and liberals began turning against him because of the war. Amidst concerns about the federal deficit, the president felt cornered into asking for a tax surcharge in 1968. The increase was not popular with the voters. Riots continued in black neighborhoods. McCarthy received 42% of the vote in the New Hampshire Democratic primary; within a few weeks, Johnson had withdrawn from the race. The next month, King was assassinated in Memphis. Though outrage over the killing led to the final major civil rights law, which banned discrimination in housing, Richard Nixon was elected president (defeating Humphrey) in November. Zelizer convincingly dispels the notion of a liberal era. 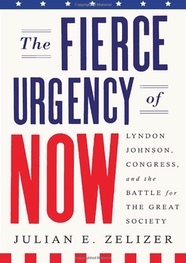 The reader might be surprised to realize, upon finishing The Fierce Urgency of Now, that the book covers a period of perhaps five years, and that the bulk of the legislation actually passed between 1964 and 1966. Covering such a short period, Zelizer is able to offer a richly detailed narrative that chronicles the simultaneous actions of lawmakers, activists and voters in the service of a holistic account of political change. The Fierce Urgency of Now successfullyanswers its author’s own call for a new kind of political history.